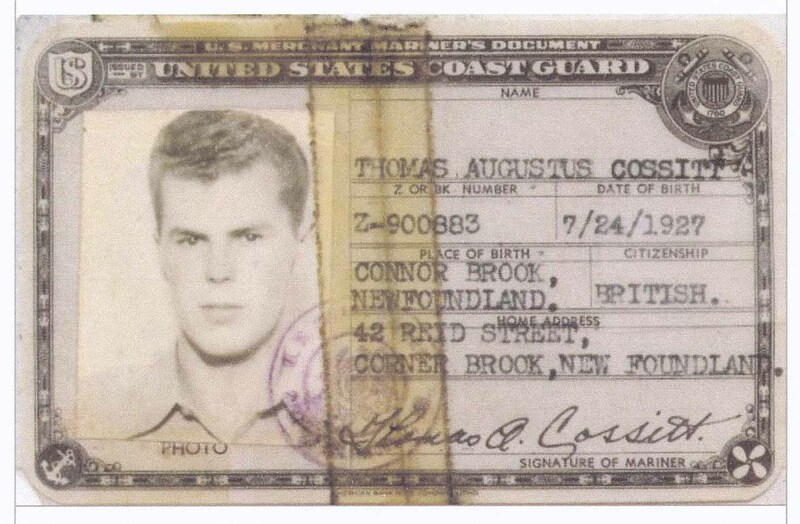 Thomas Augustus Cossitt was born on July 24, 1927 in Connor Brook, Newfoundland. He was a 5th great grandson of Ruth and Rene Cossitt. 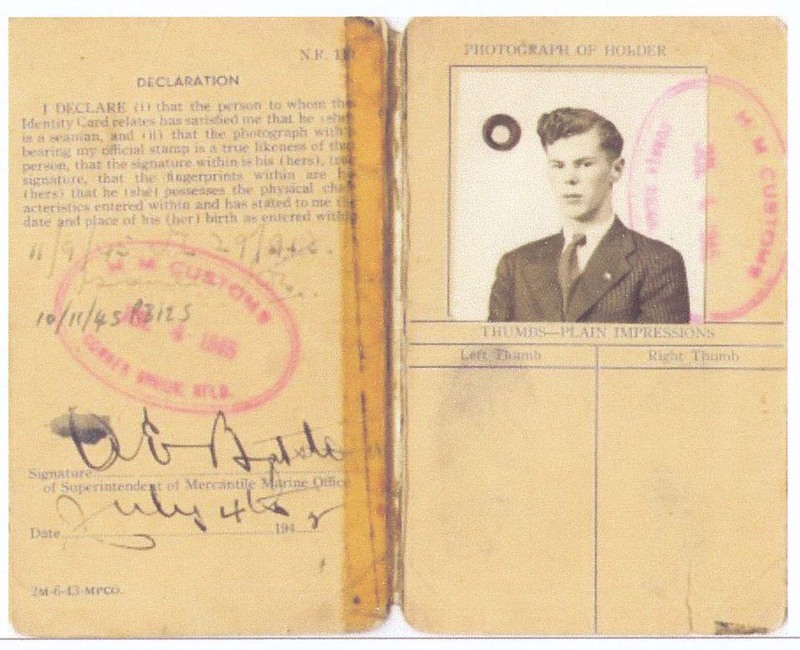 He was a veteran of WW II, having served in the United States Merchant Marines. The following is a transcript of an audio interview that he recently gave concerning his service in the United States Merchant Marines. 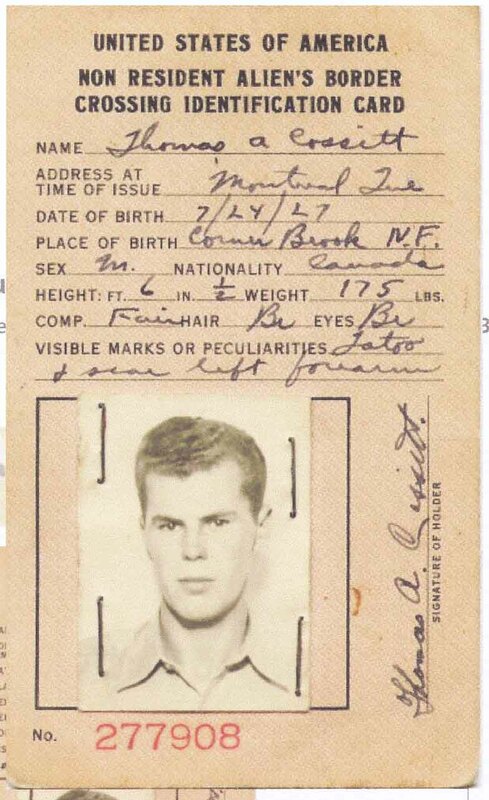 The Cossitt Family Association thanks Cousin Gus for granting us permission to post this transcript, as well as pictures of his ID documents. The first ship it was a Greek, and I joined her on a pierhead jump, and went with that, and stayed just a few months and I got off and I wound up, I got to the UK. I joined one of Bowater ships in England, the Corner Brook, named after the city here or the town at that time. And I stayed in her for then, actually, I was in her twice. The first time I was on, I was on her 11 months; and the next time, I think, was eight months I stayed on her. In between, I was on other ships then too. So you know, there was several convoy crossings to the UK and then to West Africa. She did 70-- 68 or 70 crossings, I forget now. There was half of that because she had to go over and come back again obviously, that’s where you get the 70 there. But see, she was a darned good ship. She was under the flag, under the funnel colors of Furness Withy, who were the agents for Bowater and this was it then. When I joined, there was what was known as a junior ordinary seaman, a JOS. And I come up through then to the senior ordinary seaman, SOS. Then there was another, because of shortage of ABs, able seamen, they got a new rating which you took an examination for it; and if you knew your seamanship good enough, you got what was known as an EDH, which is an efficient deck hand. And you got able seaman’s pay, less a pound ̶ they were British wages by the way, less a pound. And after your four years before the mast you finally became a full-fledged able seaman. And in those days, that was four years before the mast. If you were on a ship for six months, you got off for a month. The month you were off didn’t count in your four years, it had to be four years sea time and that was it then. And if you were unfortunate enough, this was most unfair, if you were unfortunate enough to be torpedoed or mined, or shipwrecked and lose your ship, the minute that ship was lost, your pay stopped. You went into a lifeboat, you didn’t get a nickel for that, whether you were there five minutes or five days, or five months, you didn’t get paid and then your pay, the stoppage of pay right off the bat. Years later, some of the companies would reimburse you for clothes lost. That’s your gear that you lost, by the way, and everything else. And most seamen didn’t have a lot of clothes anyways, so back in those days when a suit only cost $18 or $19, you know, you didn’t wind up with very much. But the worst I remember, like I say, I loved every minute, but was in the wintertime in the North Atlantic. It was the coldest bloody place in the world and the ice, the ice, the ice, you cut and chopped it. And we always seemed to be cold, we always seemed to be wet. And we served on a lot of British ships and being a Newfoundlander, their cooking’s a little bit different than ours. And we had fresh food for the first two days and after that, we ran out of it and, of course, we got more curry and rice, and mutton, mutton, mutton. Good Lord, I can’t even wear wool socks now. However, like I said, I enjoyed every minute. It still was good and I had good shipmates; and I served in good ships, good companies. Some, of course, were better than others, but I was very, very fortunate, my choice of ships, the ones I wound up in. As again, I said, I wanted to do it and because I wanted to do it, I got by all the time.